Improve your operational profits and performance with my MRP / ERP improvement guide. Is your MRP system helping your business to perform, or is it just creating more work for you? ‘Making MRP work’ is a practical guide aimed at Operations Managers and business directors who need some support with their MRP / ERP system. If you are operating an existing MRP system but feel that it could be doing more for you then this book can help you to identify the changes you need to make. Many businesses find themselves with similar problems. Materials being ordered too late, confusion on the shop floor and spreadsheets are used rather than the system. Does this sound familiar? The sections of this book take you on a journey from the style of approach in using MRP, through the fundamentals and into the effective management of your teams to get the most from your system. Each section concludes with action steps to help you develop your own improvement plan. The final section of the book looks more generally at business improvement projects, with the aim of helping you to create an effective change plan for your own MRP system. 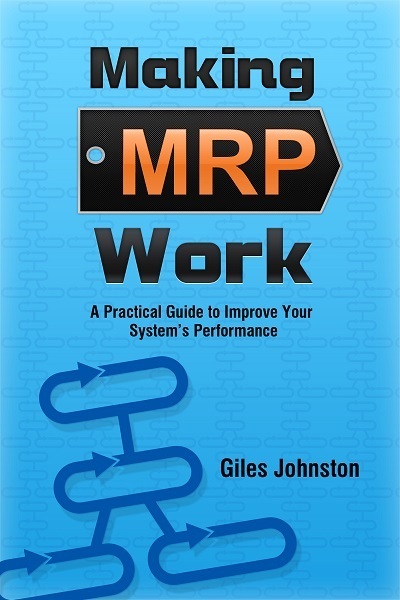 Giles Johnston, the author of ‘Making MRP Work’, is a Chartered Engineer and Business Improvement Consultant who spends a lot of his time working with his client’s MRP / ERP systems. The ideas and advice in this book are based on practical experience, not text book type theory. If you want a workable plan to improve your business’ performance and MRP is already part of your business then this book could provide the information and insight you are looking for.